Why do politicians lined up to support the Southern Gas Corridor project, which will have annual capacity of no more than two per cent of the EU gas consumption? According to estimates from the trade association Eurogas, natural gas consumption in the 28 European Union Member States grew by some 4% last year to 426.3 bcm. Demand for gas in the EU will continue to increase, so it is important to look for new opportunities to import it, because our own production has decreased significantly. From 2004 to 2014 gas production in the EU fell by 42%. In the third quarter of last year, a leading producer of gas in the EU the Netherlands became a net importer. British gas fields in the North Sea are gradually being exhausted. 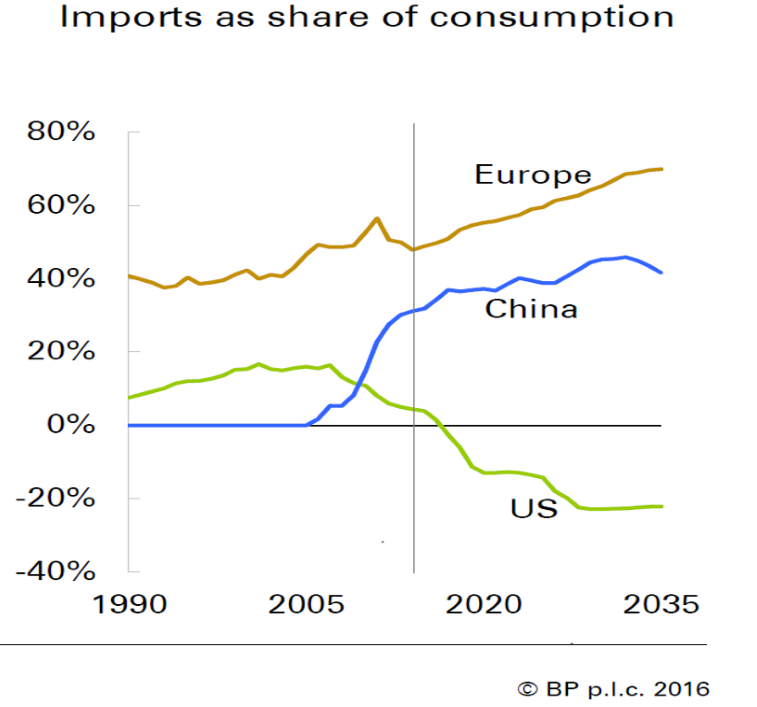 The future of the EU gas market illustrates a graph below taken from the 2016 edition of BP's Energy Outlook, which shows a stable rise of the imports share in the European gas consumption over the next twenty years. 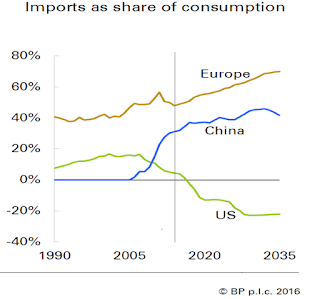 In the previous decade, the EU started seeking opportunities to increase gas imports. The European Commission put forward an idea of the Southern Gas Corridor for the gas supply from Caspian and Middle Eastern regions to Europe. This initiative was in the European Commission's Communication "Second Strategic Energy Review – An EU Energy Security and Solidarity Action Plan" (COM/2008/781). It took many years for the idea of the European Commission finally came to the realization phase. Remarkably, during that time Russia, Germany, the Netherlands and France had carried out the construction of the Nord Stream offshore pipeline from Vyborg to Greifswald. It has an annual capacity of 55 bcm. Germany begun to import Russian gas through the Baltic Sea in November 2011. The Southern Gas Corridor: Would the dwarf project grow up under perfect conditions of being placed on the EU knees? It is currently known that within the framework of the Southern Gas Corridor, Azerbaijan plans to bring the Caspian gas to Europe from Shah-Deniz 2 via the Trans Anatolian Pipeline (TANAP), which will transport gas across Turkey, and the Trans Adriatic Pipeline (TAP), which will take gas through Greece and Albania into Italy. First gas is targeted in 2019 for supplies to Turkey. Gas deliveries to Europe are expected in 2020. The designed capacity of the pipeline is 16 bcm of natural gas per year. Turkey will import 6 bcm of gas from the pipeline. The remaining volume of 10 bcm will be delivered through TAP for the European customers. Out of this capacity, 8 bcm will be marketed in Italy and the rest will be equally divided between Greece and Bulgaria. On the scale of gas consumption in the EU 10 bcm is an extremely small volume, which accounts for only 2.3% of the annual consumption in 2015. If an annual rate of gas consumption growth in the EU remains at the same level of 4% up to the commissioning of the Southern Gas Corridor in 2020, in five years the share of TANAP-TAP will be even less than 2%. Therefore, a comparison of the Southern Gas Corridor to a "dwarf" can be deemed quite appropriate. Of course, some can argue that "albeit it is extremely small dwarf project, but nevertheless it is important" because it is given a very special role to play in diversification of gas supply routes to Europe as a part of the European Commission's comprehensive Energy Security Strategy. Why does the European Commission pay so much attention to the only one new pipeline route of a relatively dwarf size to ensure gas imports to the EU? Whether is it possible that, while being in the singular, the Southern Gas Corridor will be capable to perform the assigned role for achieving the diversification, particularly in view of the challenges related to this project, which will be considered on the following pages?